A crowd attacked a building belonging to Turkey’s pro-Kurdish Peoples’ Democratic Party (HDP), the T24 news portal reported. 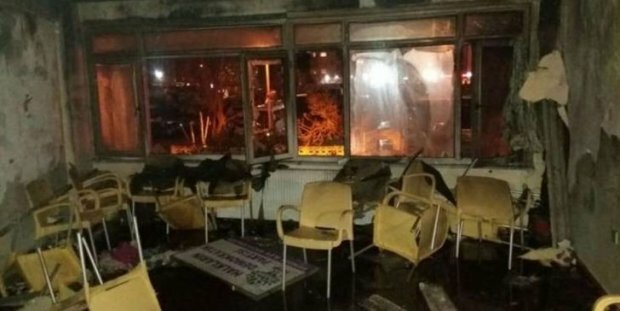 Pictures from the scene appeared to show the HDP building in İstanbul’s Pendik district vandalized and racist, sexist graffiti drawn on walls. Last week, Turkish troops entered Afrin area, which is controlled by the outlawed Kurdistan Workers’ Party’s (PKK) extension PYD. Since early Sunday morning, Turkish public prosecutor’s offices issued detention warrants for at least 41 people accross Turkey for criticizing the military operation. Turkey views the PYD as the Syrian extension of the PKK. Turkey has stepped up its crackdown on Kurdish politicians since 2016. Trustees have been appointed to dozens of municipalities in the country’s predominantly Kurdish Southeast, while hundreds of local Kurdish politicians have been arrested on terror charges.